Combining endurance and speed, the Weimaraner is an outstanding hunting dog breed. Alert, graceful, with dignified features and a kind expression, the Weimaraner dog breed is blessed with an excellent sense of smell and an effortless, smooth gait. The Weimaraner originated in Germany. Weimaraners range from 22 inches to 27 inches. Weimaraners range from 70 to 86 pounds. Weimaraners typically range between shades of mouse-gray to silver gray. Weimaraners have short, smooth and dense coats. This dog breed is an average shedder and requires minimal brushing to keep its coat looking neat. The Weimaraner is an alert and friendly dog breed. Energetic and intelligent, the Weimaraner needs an active and confident owner to train, socialize and exercise it. Timid with strangers, the Weimaraner makes an excellent watchdog. 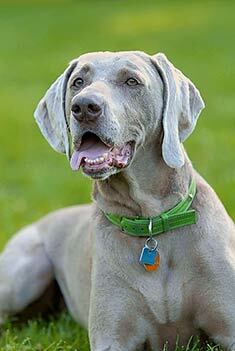 The Weimaraner is susceptible to hip dysplasia and gastric torsion. The expected life span of the Weimaraner is 10-13 years. 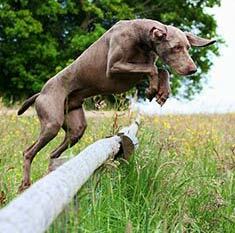 Weimaraners do best in a house with a fenced yard, since they tend to be inactive indoors. If trained well, Weimaraners make exceptional human companions. A Weimaraner owner should be an active and energetic person who will take time to socialize, train and exercise this dog breed. The Weimaraner is in the Sporting group. Find Weimaraner Puppies with our Free Breeder search!